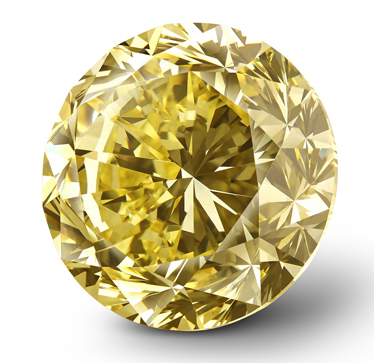 Mouawad has just completed the crafting of a yellow rough yielding an extraordinary polished 54.21 ct round brilliant cut, fancy vivid yellow, the largest ever graded to date by the Gemological Institute of America. The diamond was birthed the Mouawad Dragon as its colour is reminiscent of the Dragon’s magical powers and fiery eye. The Mouawad Dragon stone was discovered in the ancient alluvial deposits in South Africa. Historically, that area is known to have produced some of the largest yellow diamonds ever discovered. Diamonds with colour intensity such as that of the Mouawad Dragon have long been prized by collectors and gem enthusiasts. The planning and cutting off the Mouawad Dragon took over six months to complete. The Fancy Vivid colour grading of the Mouawad Dragon makes it the most desirable and rare colour on the yellow diamond spectrum. Truly a sight to behold, the Mouawad Dragon is considered to be one of the most revered coloured diamonds of all time. The Mouawad Dragon joins the impressive 51.12 carat D Flawless Dynasty diamond, a recent acquisition by Mouawad, in the ever-growing Mouawad collection. This collection includes many of the world’s most exceptional diamonds, such as the 245.35 carat Jubilee Diamond, the 135.92 carat Queen of Holland diamond, the 69.42 ct Taylor Burton, and the largest cushion shaped D IF weighting 218.08 ct.
Yellow diamonds are much appreciated by collectors. © Mouawad. Like the ancient tales surrounding the dragon and its magic, the diamond’s story began very long ago. In the earth’s upper mantle, a precise combination of extreme heat and pressure provided the circumstances necessary for the diamond’s birth. After the mineral formed, it undertook a tumultuous journey through the earth’s crust, forced upwards against unimaginable odds through volcanic conduits and pipes. Most diamonds fracture or crumble under the tremendous stress – only the strongest survive. Once the rough emerged onto earth’s surface, the rough crystal found its way into the hands of Mouawad’s master cutters, who transformed it into the sparkling 54.21 ct gem it is today. The unique striking final form of the Mouawad Dragon is a testament to both the confidence of Mouawad’s finest cutters and the innate strength of its hue. With vibrant colour beaming from every facet, the Mouawad Dragon showcases the power, wisdom, and good fortune of the mystical serpent. The Mouawad brand has penetrated continents across the world, while retaining its eminent position as jeweler to royalty, high society and those that appreciate the finest standards of dazzling craftsmanship. Steeped in rich traditions and guided forward by its fourth generation, Mouawad is committed to continuing its legacy for many more generations.